The World Environment Center’s (WEC) Board of Directors has elected the following individuals as its Officers. Kelly assumes the role of Chair with over 25 years of experience in sustainability, public and governmental policy, public affairs, and overall corporate social responsibility. 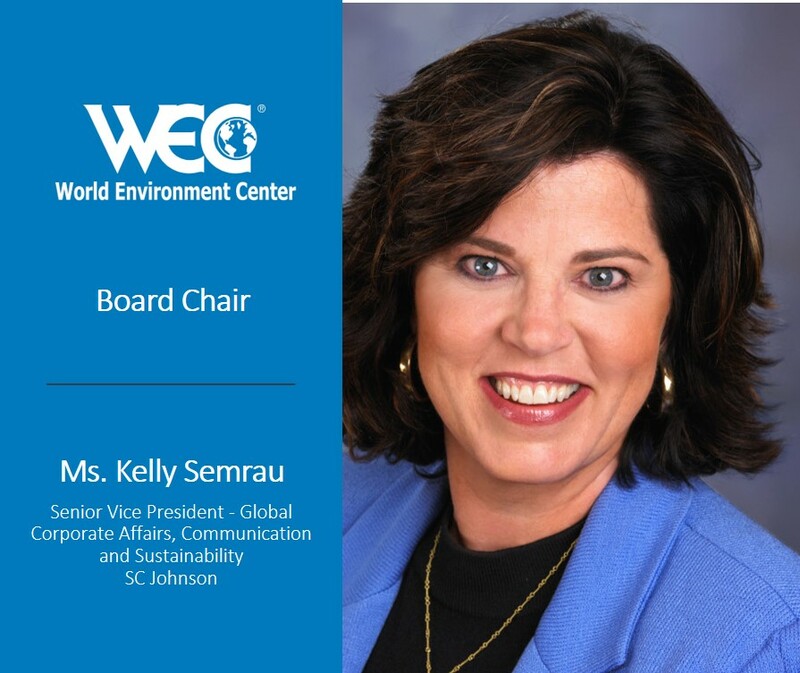 Kelly is Senior Vice President - Global Corporate Affairs, Communications & Sustainability at SC Johnson. She also sits on the Board of Trustees as the Vice Chairman and President of SC Johnson Giving, Inc., on the board of Directors of American Cleaning Institute, and on the Board of Household & Commercial Products Association. Kelly earned her undergraduate degree in journalism from Bradley University. 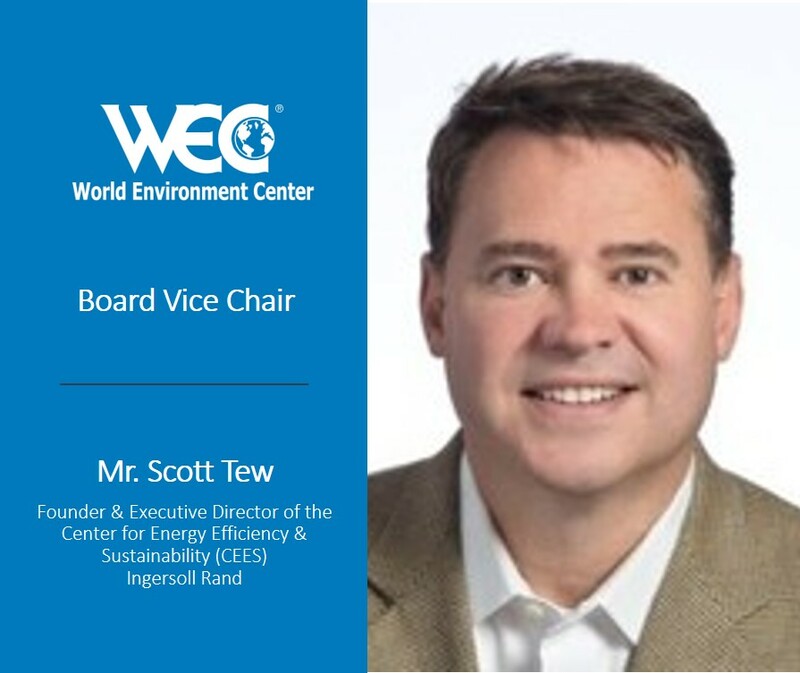 W. Scott Tew is the founder and Executive Director of the Center for Energy Efficiency & Sustainability at Ingersoll Rand (CEES), which supports the company’s strategic brands – Club Car, Ingersoll Rand, Trane and Thermo King – and is responsible for forward-looking sustainability initiatives. Scott holds graduate and undergraduate degrees in Environmental Science and Ecology from Livingston University. 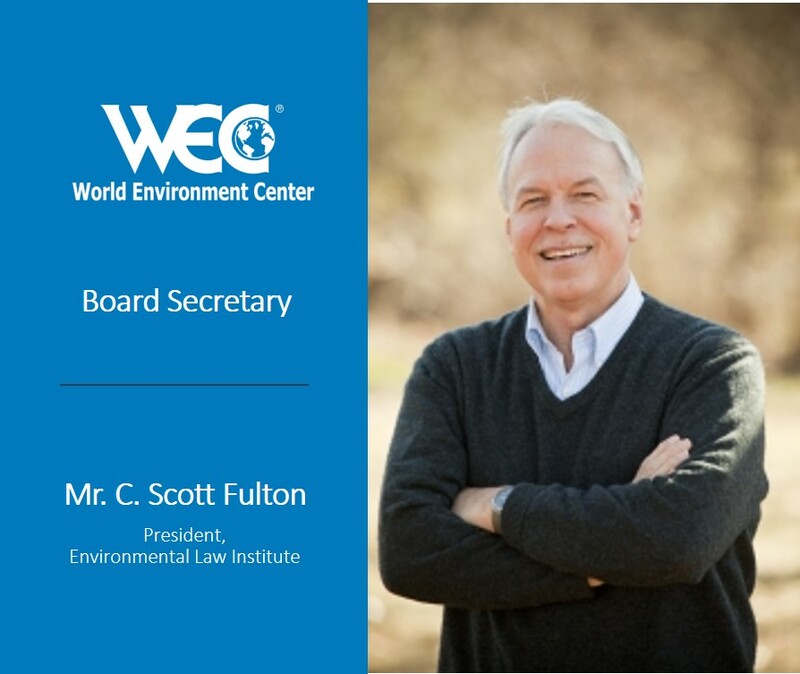 Scott Fulton is the President of the Environmental Law Institute. Previously, Mr. Fulton was Principal at the environmental law firm Beveridge & Diamond, P.C., and served as General Counsel of the U.S. Environmental Protection Agency. Scott holds a doctor of law degree from University of South Carolina School of Law and an undergraduate degree from the University of Massachusetts, Amhurst. Carol serves as the Global Head and Vice President, Environment, Health, Safety & Sustainability at Bristol Myers-Squibb. Carol has a unique ability to drive behavior and cultural change to deliver results. She specializes in US and international regulations and application. Carol received her graduate degree in finance from Berry College and undergraduate degrees from Illinois State University and Iowa State University. The Board expressed great appreciation for the leadership provided by Francisco Suárez Hernández, Director, New Business Initiatives, Coca-Cola FEMSA our outgoing Chair who will serve an additional year as a Board member. The Board also thanks Liz Maw, President & CEO, NetImpact (USA) our ex-officio Treasurer who has completed her term of service. Two new Board members and the 2019 Officers join these continuing Board members: Francisco Suárez Hernández, Director, New Business Initiatives, Coca-Cola FEMSA (MEXICO); C. Scott Fulton, Attorney at Law, Environmental Law Institute (USA), Kelly M. Semrau, , SC Johnson (United States); Mr. Mike Barry, Director of Sustainable Business, Marks & Spencer (UNITED KINGDOM); Mr. Sergio Kato, Corporate Vice President, Sustainable Management, Ricoh (JAPAN); Mr. John Mogge Director, Federal Solutions and Technology, Buildings, Infrastructure, and Advanced Facilities, Jacobs (USA); Ms. Carol Ryerkerk Powell, Global Head and Vice President, Environment, Health, Safety & Sustainability, Bristol-Myers Squibb (USA); Ms. Isabel Studer, Executive Director for Mexico and Northern Central America, The Nature Conservancy (MEXICO); Mr. Scott Tew, Executive Director, Center for Energy Efficiency & Sustainability, Ingersoll Rand (USA); Mr. Rupert Thomas, Vice President for Environment, Royal Dutch Shell (UNITED KINGDOM), Emilio Tenuta, Vice President, Corporate Sustainability, Ecolab (United States), Ms. Sheryl Telford, Vice-President Environment, Health Safety & Corporate Responsibility, The Chemours Company (USA). WEC is an independent, global non-profit, non-advocacy organization that advances sustainable development through the business practices and operations of its member companies and in partnership with governments, multi-lateral organizations, non-governmental organizations, universities and other stakeholders. WEC’s mission is to accelerate sustainability solutions through innovation, thought leadership and public-private collaboration. It manages projects for companies across their global operations, builds executive-level learning and competency in applying sustainable development across a number of business sectors, and recognizes performance excellence through an annual awards program. WEC is headquartered in Washington, D.C., with regional offices in China, El Salvador and Germany.